Student information automatically sent directly to the parent’s mobile phone! 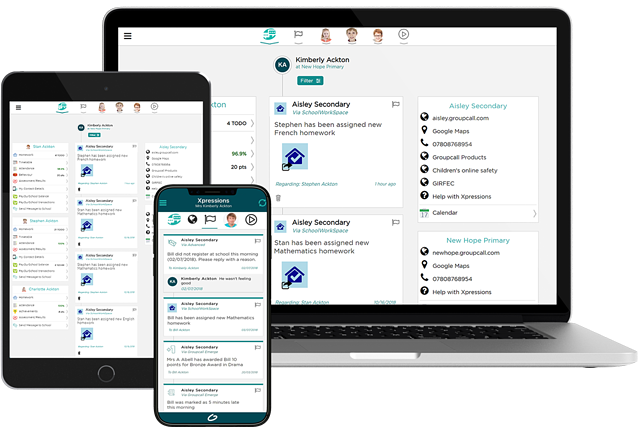 Groupcall Xpressions lets you give parents an easy way to get updates from your school via the Xpressions app on their phone or tablet. Quickly and easily send updates regarding school closures, trip updates and exam reminders using push notifications, and without the cost of an SMS text message. Xpressions is a portal where parents can receive messages from the school, such as updates, information about trips, emergency closures and more. Parents can get messages about multiple children in the same place – even if they attend different schools. Get your most important updates in front of parents quickly with Xpressions push notifications on their device. With Enhanced Xpressions app, parents have instant access to their child’s progress wherever they are through their phone or tablet. Xpressions uses banking-level encryption meaning a child’s sensitive information will never be seen by the wrong person. Give parents the option to reply to your messages to start a discussion or get an explanation for an absence. Upgrade to Enhanced Xpressions to have the ability to immediately update parents on attendance and absences, marks and grades, achievement, behaviour and timetables. Give parents instant access to how their child is performing or quickly let them know if they’re unexpectedly absent. Parents can quickly and easily download the Xpressions app to their iOS or Android mobile phone or tablet, and login using the email and mobile number stored in your MIS. Parents can then keep track of all their children, even if they go to different schools. N.B. If you are a parent, please contact your school directly to find out if they already have access to the Xpressions app, via Groupcall Messenger. If your school uses Xpressions and you need support, please visit our dedicated parents' website.